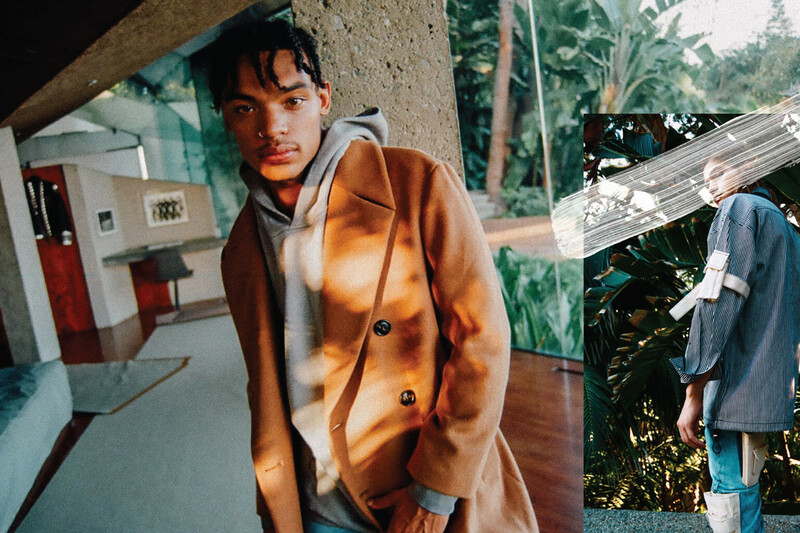 MNML is a Los Angeles-based fashion brand whose vision is to deliver high-quality on-trend menswear at an unbeatable price. Created in 2016, the company is currently achieving hyper-growth while becoming a leader in the online streetwear and menswear industry. Often featured in Hypebeast and GQ, the business is proud to rely on an established fan base, with more than 460k Instagram followers. MNML focuses on “keeping things simple", as its slogan says. The company launched with a B2C online-only business model, speaking directly to the end customer and avoiding markups. This way, MNML's core mission, namely providing wardrobe staples at fair prices, is successfully achieved. Basic style at faire prices...Well, isn't this concept very similar to global fashion brands like H&M and Zara? Then, how is a fresh new brand is able to compete and even skyrocket in such a crowded industry? 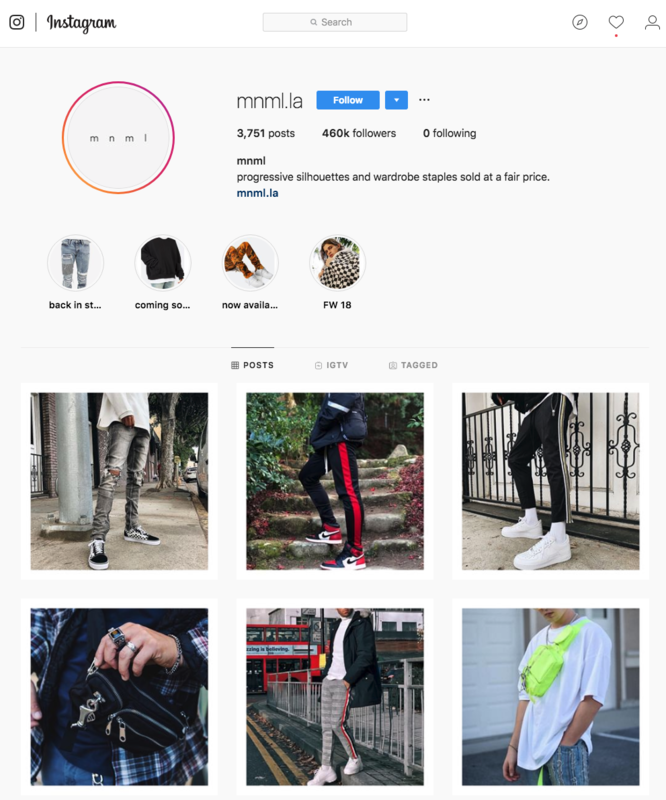 The picture above might be the answer to the success story: MNML has a disruptive vision of what street fashion is AND knows how to market it. With a small team of 10 people, MNML has created an online presence that has become viral. They heavily utilize Instagram as a communication channel and rely on micro-influencers and brand ambassadors to drive awareness. Here comes the challenge: when your online community grows, especially on social media, people start contacting you for support questions and might start complaining on these new channels. A Millennial would never contact you through a support email address when it's that easy to drop a Facebook message or comment on an Instagram post. That's when the marketing team realized that a strong online presence also means a strong need for a help desk to gather support into one place. When the company first started, Ian Anderson - the Operations Manager - was the only one doing support, using a classic mail app on his laptop. He was typing out emails from scratch, over and over again, copy-pasting some classic answers to common questions, which became overwhelming and confusing at the same time. It quickly became very clear that they should start using a help desk, not only to enjoy the magic of using macros instead of copy-pasting messages, but also to gather and manage support on “non-classic” communication channels. The choice of Zendesk, the help desk "by default"
With the soaring of sales well beyond initial forecasts, the company decided to invest in support. So they hired an in-house team of agents and invested in their first support platform: Zendesk. The choice was made by default, knowing the popularity of this software. However, agents started to complain about Zendesk. They found it not too intuitive and hard to navigate on. On top of that, Ian Anderson spotted a lack of integration with their e-commerce platform, Shopify. So he started to look for a new solution and came across Gorgias in April 2018. Not only did Gorgias offer the ability to perform Shopify actions from the help desk, but it also allowed them to manage Facebook Messenger within the same dashboard, thanks to a native one-click integration. When most of your growth relies on social networks and when re-marketing happens on Facebook, you need a solid integration between support and social media. 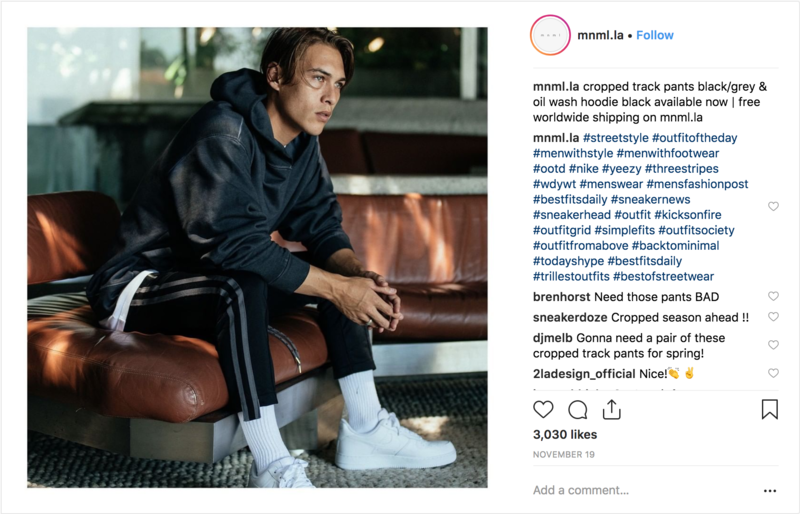 MNML's retargeting strategy to recover abandoned shopping carts mainly consists in auto-sending messages via Facebook, using ShopMessage, one of Gorgias's partners. This process re-opens the dialog and drives people back to the Shopify check out page, thus increasing sales. This way, MNML easily re-engages with potential customers. The thing is, with the ShopMessage Messenger bot, agents often need to jump in the conversation to cover the "human" part of the sale. The bot is not a sales person! Human contact is highly valuable, especially when you deal with highly-qualified leads, which is definitely the case when retargeting abandoned carts. In this way, MNML's support agents are doubling as sales reps. But this would not have been possible without Gorgias's integration with Shopify. 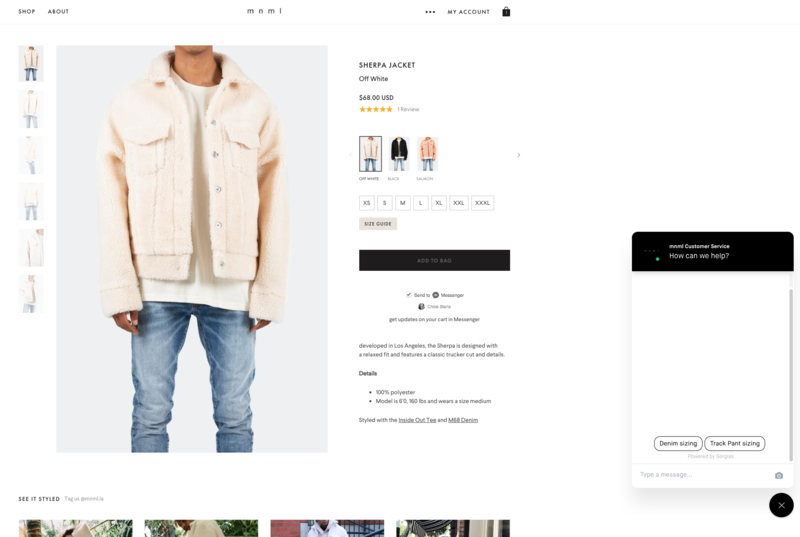 Agents are indeed able to recommend the right products to potential customers, based on order history and customer attributes that are displayed on a ticket’s right side bar in Gorgias, pulled from Shopify. Same for shipping info: if the customer has a billing address registered outside the US, the agents can have that info in the sidebar - thanks to Gorgias being able to populate all Shopify data - and pro-actively warn them about deliveries and shipping policies. Having a quick access to the side bar is super convenient and help us turn our support agents into sales people. For instance, if a potential customer asks a question about sizing, the agent can quickly have a look at their previous order info. Last but no least, MNML is actively using Gorgias chat, as well as the "chat campaigns" (consistent messages that pop up according to the web page the visitor is currently visiting). They also rely on Gorgias quick replies, shown in the example below. This is what Ian Anderson calls "quick marketing to drive sales". Since MNML switched over from Zendesk over to Gorgias, the first response time and resolution time have been reduced by 35%. ‍As for ticket creation, Gorgias's Messenger integration and live chat features have enabled the brand to better engage with potential buyers: the amount of tickets created has jumped up a solid 50%. And don't forget, those "quick marketing" tickets convert into sales! Find the right help desk to deal with Facebook Messenger retargeting strategies and drive sales. Using a combination of Gorgias Facebook integration and ShopMessage bot.